In 1959, Duane Allman became a changed man. Upon hearing the legendary B.B. King in concert, Duane turned to his younger brother Gregg and said, "We got to get into this." Their musical career soon took off with all of the passion and soul of a recent convert leaving church. Just months after his professional debut, Duane Allman was in high demand as a session musician, laying down tracks for greats like Aretha Franklin, Wilson Pickett, Otis Rush, Johnny Jenkins, Boz Scaggs, and jazz flautist Herbie Mann. When famed Atlantic Records producer, Jerry Wexler, heard a recording of Duane Allman over the telephone, he offered to buy Duane's contract on the spot. On March 5th 1998, the Georgia State Senate passed a resolution designating the intersection of Holt Avenue to College Street as "Duane Allman Boulevard"
But Duane soon tired of studio life. In early 1969, Duane and drummer Jaimoe Johanson moved to Jacksonville, Florida and began jamming with Berry Oakley, Dickey Betts, Butch Trucks, and Reese Wynans (who later went on to play keyboards for Stevie Ray Vaughn). Soon, younger brother Gregg Allman joined the group and the Allman Brothers Band took shape. Within a month, the group relocated to Macon, Georgia to be near their manager, Phil Walden, at Capricorn Sound Studios. Sadly, Duane Allman's life would end just a few months later. 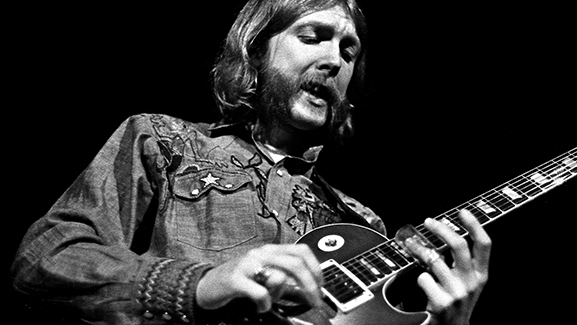 On October 29, 1971, Duane Allman died after a motorcycle wreck in Macon, Georgia. To this day, Duane Allman is remembered by family, friends, and fans for his peaceful ways, his love of life, his quick wit, and, above all, his outstanding musicianship. Fans still come to Macon, Georgia from all over the world to visit Macon sites and to pay their respects at his burial site in the Rose Hill Cemetery. "Skydog" is a variant of the name "Skyman" which was given to him by Wilson Pickett. Duane "Skydog" Allman's epitaph reads, "I love being alive and I will be the best man I possibly can. I will take love wherever I find it, and offer it to anyone who will take it...seek knowledge from those wiser, and teach those who wish to learn from me."